Clean Feed has done a lot of providing recording opportunities for people and groups whose names were hitherto unknown in the area of contemporary Jazz. 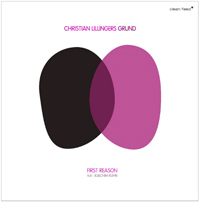 One example is this release by German drummer Christian Lillinger (3). Lillinger is a new name to me but he leads a unique ensemble with two reeds and two bassists on First Reason, his debut album as a leader. The ensemble is stacked with some first rate players. ICP Orchestra’s Tobias Delius is one of the reed players, Danish bass player Jonas Westergaard is one of the bassists, and a guest on three tracks is veteran pianist Joachim Kuhn who has been a mainstay on the German (and international) Jazz scene since the 1960s. It’s good to hear him mixing it up with these young upstarts. It’s clear that Lillinger is going for something a little different by using this unusual instrumental lineup. There’s some great writing here such as on “Die Enge” where Delius and Slavin are playing an odd static theme as the two bassists ping off each other. The two basses are an integral part of the grounding of this music. At times they play in tandem or contrapuntally but frequently their parts seem to ricochet off each other. The dual bass solo at the beginning of Delius’ “The Heron” (nice to hear an alternate version to the one that was on Delius’ ICP debut disc) is one of the high points of the disc. Delius’ burly tenor is a good contrast to Slavin’s more liquid sounding alto. Lillinger drives this ensemble with a clattering energy (love his drumming on the opener “Pfranz”), that gives this music a distinct character. First Reason is an auspicious debut.